Our November concert is just 1 week away. Join us at Christ Church, Chelmsford for an evening of music by Handel, Lauridsen, Part, and Vaughan Williams. Click here for more information. Michael Gray’s review of our Music for Passiontide concert can now be found here. Tickets are now on sale for our Christmas concert on Saturday, 19th December. Join us for an evening of Festive music, accompanied by Westminster Brass. We’re getting close to our next Open Rehearsal – Tuesday 5th September at 7:30pm. Click here for more information. The Chelmsford Singers are looking for new members to join us next year! We’re holding our next Open Rehearsal on Tuesday 5th September at 7:30pm at our usual rehearsal venue, the Cathedral Primary School on Victoria Road, Chelmsford. 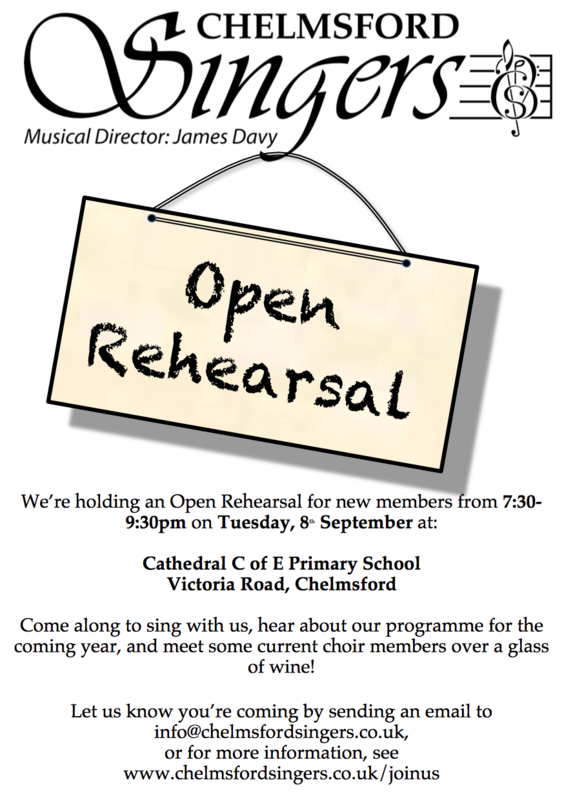 Open Rehearsals are a great opportunity to come and see if you’d like to join the Choir. At this informal rehearsal for our next concert there’ll be chance to sing with us, to meet current members and to find out what the choir is like. The rehearsal will be shorter than usual lasting for about an hour and will be followed by drinks. Rehearsals usually finish by 9:30. Directions to the rehearsal venue can be found here. 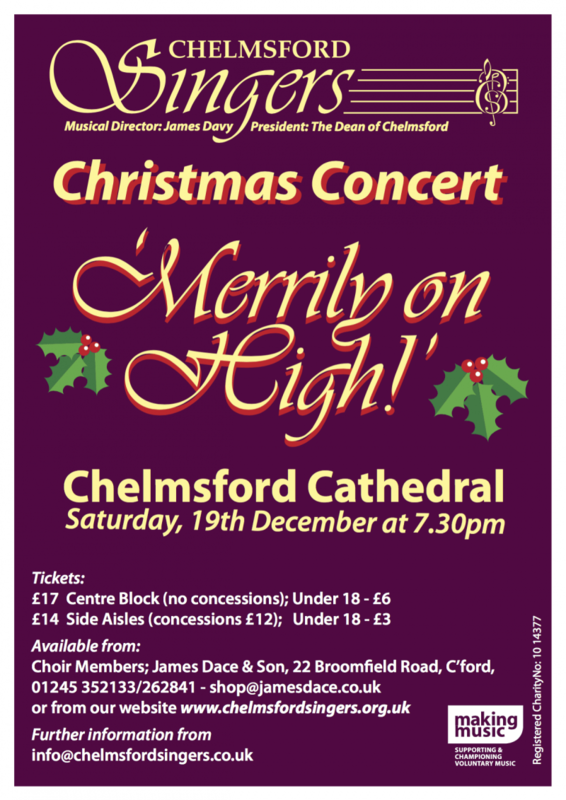 If you’re planning on coming, or for more information, please drop us a line at info@chelmsfordsingers.co.uk so we can make sure we have enough music. Summer Concert – Save the Date! Our next concert is on Saturday, 27th June, at All Saints’ Church, Purleigh. 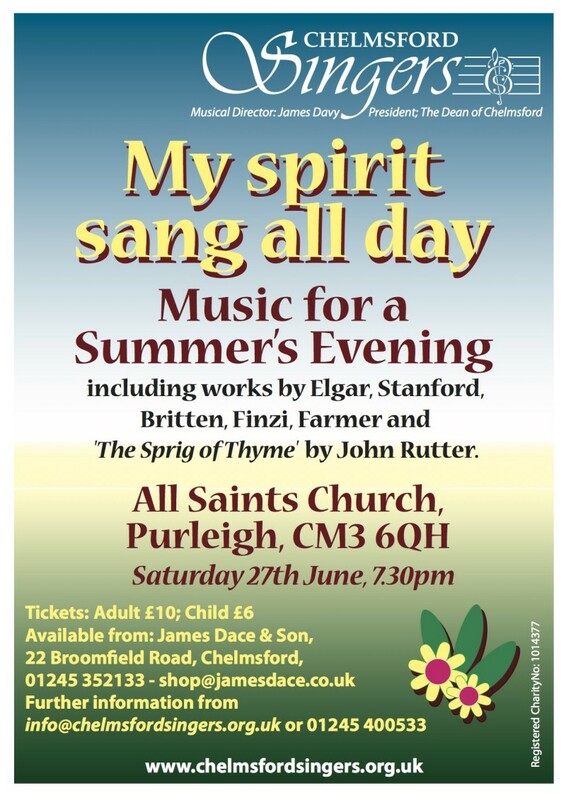 Featuring a selection of music by Elgar, Stamford, Britten and Finzi, the programme will also include John Rutter’s cycle of British folk songs, ‘The Sprig of Thyme’. Tickets are now available from James Dace & Son, Broomfield Road. For more information, click here.